Only 50 meters from the “Jardin des Tuileries”, 250 meters from the Louvre and 5 minutes walk from the Seine or from the stylish shops of the “Rue Saint-Honoré”, the studio is on the top floor (with a lift) of a typical Parisian building. It includes a sleeping area, a bathroom (with a proper bath), a lounge and kitchen leading to the terrace, where in the background you can see both the Eiffel tower and the Sacré-Coeur. Total floor area is 25 sq m² (260 sq ft). It is very bright & quiet, and offers all of the modern conveniences, microwave, washing machine, dishwasher & fast Internet connection, also free use of the telephone. Best for 2, but can accommodate 4 (they'll be an additional charge of 50€ per person beyond 2 guests). 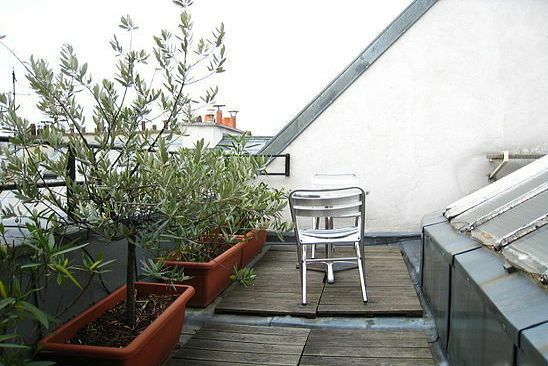 This flat is perfectly located and has the best rooftop terrace - you can't ask for more! JP is a terrific owner & we had a wonderful stay at the apartment. My husband arrived before me & JP gave him a very warm welcome & he immediately felt at home. The Wifi was fast, the use of the landline was a great bonus, and again - the location is perfect. We've rented many apartments in Paris & this was one of the best...if it's available, you should book this rental! Charming place with every amenity you can think of. The place has a cook top,washing machine, dish washer microwave/oven, TV, Phone, WIFI, and the best Landlord in the world. JP went out of his way to see that we had everything we needed and were comfortable during our stay. We had a very nice stay in the appartment, everything was clean and newly painted. The arrival was very well organised, the mail and telephone contact with the owner was perfect. From the appartment we had a beautiful view of the Eiffel tower, at 10 p.m. all the lights twinkel for 15 minuts, spectaculair! The terrace was also very nice and gives a nice view of the eiffel tower and the sacre coeur. When you leave the appartment it is a few minutes away from the Tuileries, Louvre, Seine, bakery, metro and the Eiffel Tower is a nice walk away. We could highly recommend this wel priced appartment and will definately stay here again in the future, thank you JP! Thank you Janette, you're welcome back anytime ! Exactly as advertised: Charming, clean, very welcoming owner. I visited Paris on business during a cold week in the end of January 2015. The apartment is small and a bit rustic, but cozy, warm, and extremely well situated. The photos give a great idea of the rooftop views (though you need to climb over what is either a very high door jamb or a low windowsill to get outside). You can see lovely Paris rooftops, the Eiffel Tower, and Sacre Coeur. There are narrow stairs to ascend from where the elevator drops you to the door of the flat (you're essentially in the attic) so it's not going appropriate for many elderly or very young travelers. But for a single person or couple, it's an intimate pied-a-terre around the corner from the Place Vendome. Highly recommended. L'appartamento ha un'ottima posizione, centralissimo e a pochi passi dalla fermata della Metro 1 (gialla) di Tuileries. Vicino a 2 supermercati facilmente raggiungibili a piedi. Ideale per una coppia e molto caldo! Gode di una splendida vista sui tetti di Parigi con uno scorcio sulla Tour Eiffel!! Il proprietario è molto simpatico e disponibile in ogni cosa! Veramente consigliato a chiunque voglia trascorrere qualche giorno in questa meravigliosa città! Ci ritorneremo sicuramente! Thank you Matteo and Giulia, i'm so glad you had a good time in Paris and grazie mille for your review ! The apartment is in a great location, very central, only a few steps from the Metro station ("Tuileries" on line 1) . It's also within short walking distance of two supermarkets. Ideal for a couple, very well heated, It enjoys a splendid view over the rooftops of Paris, with the Eiffel Tower in the background ! The owner was very personable and helpful in every way ! Really recommended to anyone who wants to spend a few days in this wonderful city ! We will definitely return ! The flat is 500m away from the Opera, 50m from the Tuileries Garden. The nearest tube station is 'Tuileries'.